Bio: Adriana Meiss was born in Costa Rica, where she spent her formative years. While she always had a strong interest in the arts, she graduated from Universidad de Costa Rica, San José, with a degree in biology and went to New York to pursue graduate studies in Forest Resources Management at SUNY-ESF. In between she sandwiched in two semesters of art courses. About 2001 she was exposed to the versatility of the pastel technique and the brilliance of the medium when she visited a local art exhibition. She immediately started experimenting, finding that the intervening years of observation allowed her to paint in a different way, and that her career in silviculture informed her treatment of landscape. Apart from those two early semesters, Adriana considers herself self-taught, although she has taken workshops with Nicora Gangi, Mary Padgett, Marc Hanson, Susan Ogilvie, Robert Carsten, and Liz Haywood-Sullivan. 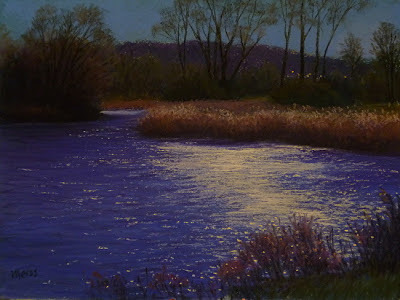 Adriana is a member of the Adirondack Pastel Society. 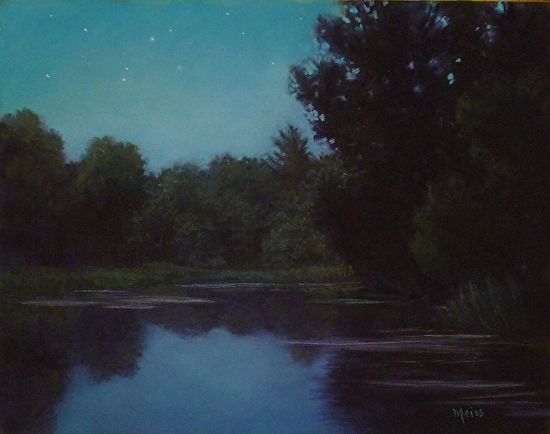 Recently her painting Of Crickets and Frogs (featured) was accepted in the IAPS web show. She is represented by Gallery 54, 54 E. Genesee Street, Skaneateles, New York. Medium: Pastel. Adriana paints in the studio and on location. "My aim is to express in my painting how the subject affects me. For that purpose I always ask myself questions like "What if…? ", which usually lead me to a more expressive and creative approach. Sanded paper and board are my preferred substrates and I use a variety of pastel brands. I like to work fast to prevent overworking the painting and to maintain my interest." Style: Representational. Adriana states that she is not looking for a perfect rendition of the landscape or objects, but rather striving to convey a feeling and a sense of place. Gallery: (Paintings) Recent Work; Landscapes; Adirondack Scenes; On Location; Florals. Image View: Generally the thumbnails are labelled with medium and dimension, and enlarge in a scrollable viewer.